los reported de “incidentes de seguridad” en ciertas carreteras principales. nadie en cualquier carretera en la noche o durante el dia. nuestro amor, preocupacion y soporte. manera en que pudieramos trabajar juntos en esto?. programas suspendidos debido al clima de vioslencia. EE.UU. por su trafico de drogas y los incidentes de violencia. trauma con un testimonio del amor de Dios, ! Gracias a Dios ! Mil gracias a Alfonso Amparan por su traduccion de este articulo al espanol. esperanza que hay en vosotros”. 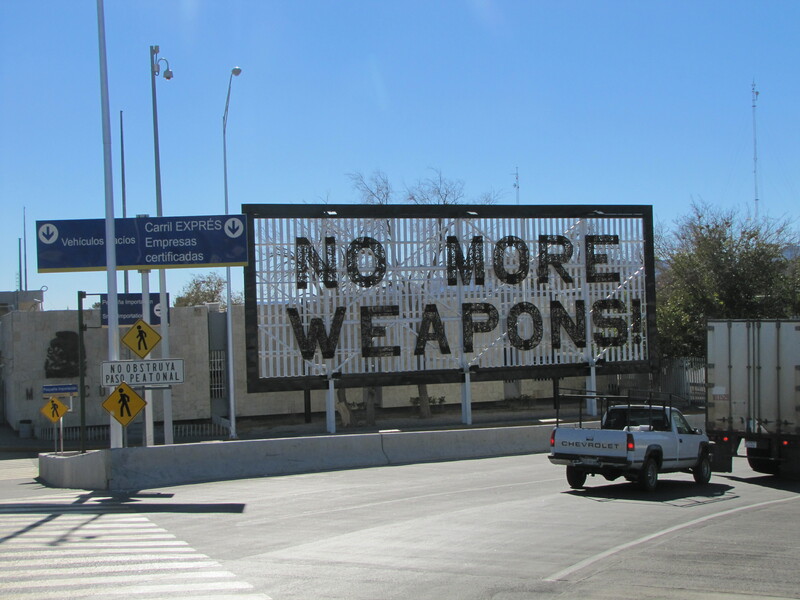 The major difference between the sub-cultures dedicated to violence in Mexico and the U.S. is that virtually every family in Mexico has been affected in some way by the “inseguridad”/insecurity that hovers over many areas of the country. Travel routes are determined by the reports of “incidents of insecurity” on certain major highways. Precautions are taken such as not driving at night on any highway especially in rural areas and one is advised to stop for no one on any highway at night or daytime. We’ve been living here for just a year now and yes we know the effects of the rise in violence. The brother of a close friend was kidnapped for ransom recently in a neighboring state but, thanks to the quick response of his family, was released unharmed two days later. Our friend was terribly shaken by the family’s ordeal and Kate and I are still involved in finding ways to express our love, concern and support. 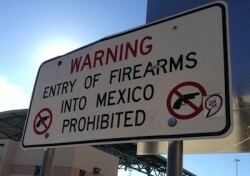 Civilian possession of “military grade firearms”, including automatic assault weapons, is also prohibited in Mexico. trips curtailed, no programs avoided because of the climate of violence. Last year a van loaded with Disciples from Ciudad Juarez headed at night to San Luis for the men’s convention but was forced to stop by a roadblock and personal items and the van were stolen. Unhurt, the delegates returned home by bus. This year, undaunted by the losses of the previous year, an even larger delegation of men and women drove from Juarez for the Disciples Church’s annual convention. The source of the coffee marketed by San Luis Potosi Disciples women, in an ambitious “microenterprise” project, comes from the most dangerous area of the State. Although the coffee is grown by Disciples women in a region where drug cartel reprisals have taken place, we have not heard a word about the danger faced by the women traveling there. Secondly, the Church here helps life go on with the regular round of holidays and traditions in a way that celebrates the presence with us of the one whose “perfect love drives out fear” (I Jn 4:18). In this regard, we think of Pastor Victor and wife now living and working in Villa Union, a devastatingly poor community on the outskirts of Mazatlan, Sinaloa. Most youth in that community, Pastor Victor told us, see two options for their lives: seasonal netting of shrimp or low level involvement in the drug trade. Victor and his spouse hope to broaden the youth’s vision for their lives. One new opportunity they began to offer on moving to the community was training in music. Other Congregational Churches in Sinaloa, the state with the oldest -and biggest?- drug cartel in Mexico, are involved in serving families most vulnerable to use of drugs and involvement in their trade. Women in several Sinaloa Congregational churches have started small businesses with funding support from Global Ministries. The Mazatlan Church carries out an array of programs serving the poor, free health consultations among them. So life goes on in Sinaloa and other states of Mexico in part thanks to the dynamic witness of our partner churches in regions primarily known in the U.S. for their drug trafficking and incidents of violence. In these partner churches, babies are dedicated, marriages performed, birthdays acknowledged and the Communion of the Lord’s Supper is celebrated. In a sense, all of those who participate in worship here are declaring that love triumphs over fear. As communities of faith representing that “good news”, Church members are also prepared to enfold those who do experience loss and trauma with a witness to God’s love. Thanks be to God! P.S. : We were pleased to learn recently that the popular U.S. cruises from Los Angeles and other West coast cities to Mazatlan will resume next year after a three year hiatus. 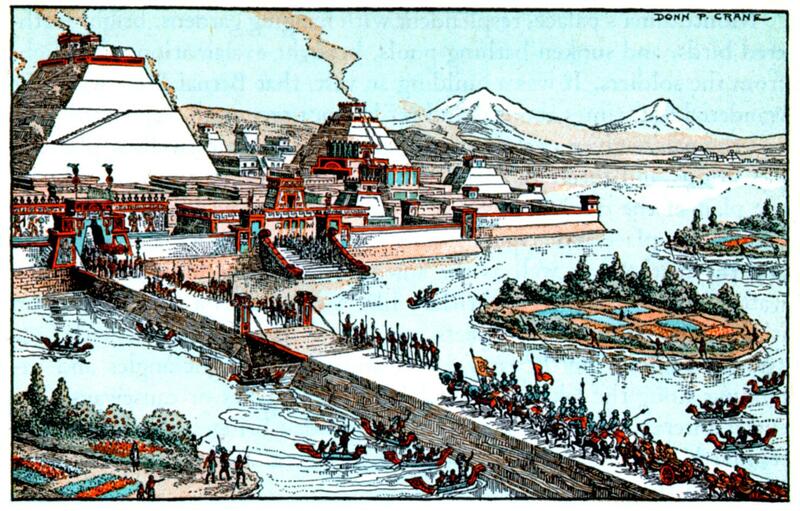 Cortes and troops were dazzled as they entered the “capital of the Western world”, Tenochtitlan (now Mexico City) on November 8, 1519. The Spanish conquest and colonisation of the New World soon led to a debate over enslavement of the Indian native population decades before the rest of Europe confronted the horror and injustice of the enslavement of Africans. This was due in large part to a few prophetic priests’ fierce criticism of their fellow countrymen’s treatment of Indians. 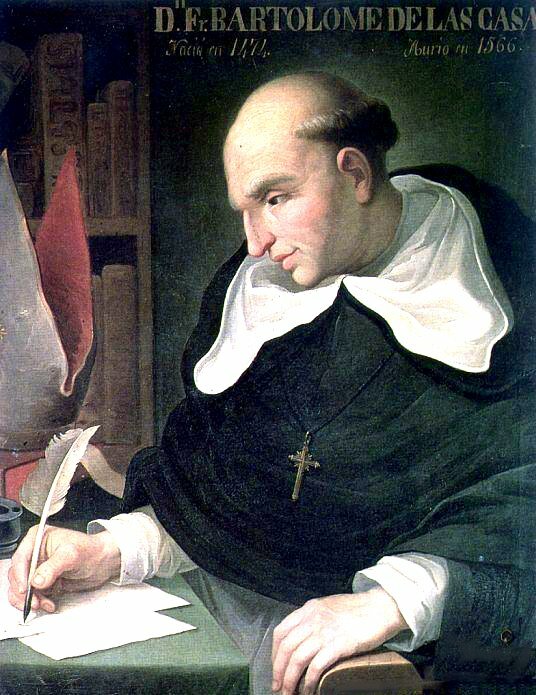 The leading defender of the Indians, Father Bartholomew De las Casas, devoted himself for fifty years to enactment of labor reform in the Spanish colonies and to proclaiming the liberty and equality of the original inhabitants. Sent in 1502 to manage the properties of his father in the Domincan Republic, De las Casas himself owned Indian slaves before he was converted to protect and defend the Indians by some powerful preaching and by his studies of the Bible. Consecrated as a priest by the Dominicans in 1510, he heard Father Antonio de Montosinos preach in the cathedral of Santo Domingo against all forms of oppression and exploitation. Anticipating the furious response to his sermon, Father de Montosinos chose the text, “I am the voice of one crying in the wilderness”. His congregation included the colony’s highest officials who demanded the priest retract his views in the following Sunday’s sermon. Prior to the next Sunday’s sermon, the Prior of the Dominican community assured the officials that Father de Montosinos spoke for all the priests serving the colony. With this backing from his superior, the indomnitable de Montosinos based his sermon on Job 36:3 the following Sunday and added to his denunciations of injustices the proclamation that the sacraments would be denied any slave holder in the colony. It seems important to note that the views of Father De las Casas on the treatment of the colonies’ natives were slow in evolving. Father de Montesinos mentored De las Casas with the warning, “the truth has ever had many enemies and falsehood many defenders”. Consecrated a priest at age 36, his first charge was managing a property and converting Indians in Cuba. Having witnessed gruesome attacks by Spaniards on “rebellious” Indians and the routine mistreatment of their laborers by the Spanish settlers, the turning point for the middle aged priest came on Pentecost 1514. Father Bartholomew de las Casas was converted to the cause of the Indians in 1514 and labored tirelessly on their behalf until his death in 1566 at age 92.
and he that defraudeth the laborer of his hire is a bloodshedder.” His biographer tells us of the impact of this text and his sermon on the preacher: “until then he had been zealous in protecting the Indians against massacre and pillage, but to the injustice of the servitude imposed upon them, he was insensible”. The sermon’s effect was immediate on the preacher. De las Casas met with the Governor of Cuba to relinquish his properties and his rule over the Indians working there. He further began to make plans for his first of many trips to Spain to plea eloquently for equal rights for the Indians of the New World. The message in Spain on this first trip and all that followed included the conviction that those who ignored the rights of those created in God’s image would be condemned eternally in the court of God’s justice. It took De las Casas a few years to extend his doctrine of justice and equality for the natives of the New World to the slaves bought on the coasts of Africa. When pressed on one of his first advocacy tours of Spain whether it would be acceptable to replace Indian laborers with African slaves working in Spain or direct from Africa, the defender of the Indians gave his approval to importing Africans as well as Spanish laborers. For nearly one hundred years Spain had bought African slaves from the Portuguese traders and they were a prominent feature of Spanish society especially in Las Casas’ hometown of Seville. De las Casas soon recanted from his support for African slave labor and extended his doctrine of equality and justice for those exploited by European rule to all the world’s colonized people. Reading accounts of the conquest and colonization of the New World found in the Western Hemisphere one is struck by the consistent reference to conversion of the natives as the primary motive for the daring adventures. Cortes for example masterfully employed advance of the true faith in motivating his small band to enter yet another battle with the Indians. So how could their “championing of the Cross” have resulted in the near total decimation of the Indian population in the colonies of Spain? The great 19th century historian of the conquest William Prescott provided another explanation of the Spanish sins in their colonies: “Religion in that day was one of form and elaborate ceremony. In the punctilious attention to discipline, the spirit of Christianity was permitted to evaporate.” This sounds like something we need to be attentive to and avoid in our own day.